Few comic book characters conjure up horror and then heroism, and then back to horror again, better than Venom. Since debuting in Amazing Spider-Man #300, the inky black space alien has steadily wrapped its tendrils into the hearts of Marvel readers everywhere. The symbiotic creature has proven so consistently popular that it even landed its own movie at Sony, where execs intend to use the character as a cornerstone of its cinematic spider-verse. To prove it, they landed acclaimed star Tom Hardy to play Eddie Brock, the lucky—or unlucky, depending on how you feel about extreme co-dependency with an incredibly powerful visitor from a far-off planet—host of the slinky sentient super suit. But Venom has a long and curious history at Marvel that goes deeper than most people realize, with decades of stories that probably won't even be hinted at on the big screen for several sequels to come (if ever). This is the untold truth of Venom. Traditionally, many comic creators tested their ideas on the fly (see Jack Kirby famously dropping Silver Surfer on an unsuspecting Stan Lee) or borrowed concepts from their competitors. The idea for Venom actually arrived with an inventive fan. The symbiote began life as an idea for a costume change, when Spider-fan Randy Schueller drew up what he called a "stealth suit" for Peter Parker—after all, he'd been rocking essentially the same red and blue set of pajamas for two decades by that point. Then Marvel Editor-in-Chief Jim Shooter bought the sneaky costume idea for $220, giving Schueller a chance to write the story. Not long after its announcement, fan backlash created resistance to Spidey's new look, and Marvel creator John Byrne altered the original concept by turning the black space costume into a self-repairing costume, much like Iron Fist's get-up—also explaining away Peter Parker's otherwise colossal tailoring bill each issue. Marvel readers took to the new garb after all, and Byrne's twist was changed into a symbiotic life form, before David Michelinie and Todd McFarlane gave Venom his signature look and characteristics. Ironically, Schueller wasn't a fan of his design's villainous turn, saying he was "disturbed" by the costume-gone-wild. Watching "his creation" come to life on the big screen in Spider-Man 3, though, he's since come to terms with it. It's often said that children are the future. We sacrifice everything for them, nurturing them, passing on our values, filling them with knowledge—and the desire for succulent brainwaves—before trying to kill the little monsters for disagreeing with our murderous agenda. Of course, we're talking symbiotes' asexual reproduction and third-generation Klyntar life-form Toxin here. When Venom returned to break Eddie Brock—his favorite host after Spider-Man—out of prison, he left behind a homicidal bundle of joy named Carnage, who bonded with convicted serial killer Cletus Kasady in Amazing Spider-Man #361. 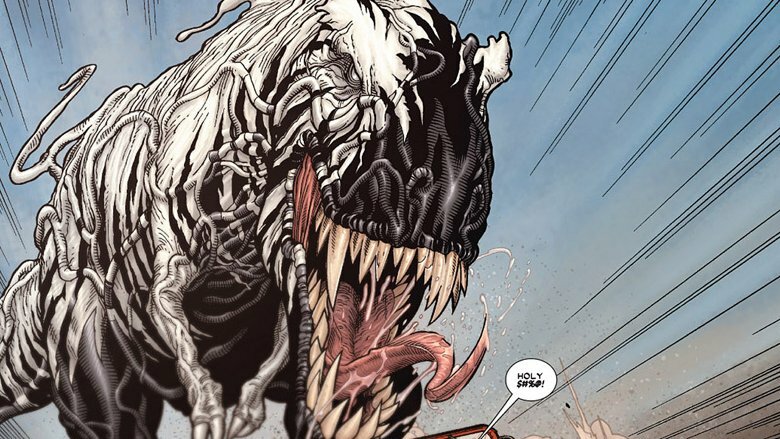 Roughly a decade later, Carnage made Venom a grand-symbiote, bearing and then trying to kill its own rugrat, Toxin, in Venom Vs. Carnage #2. After Toxin's first host Pat Mulligan was killed, it found yet another kindred spirit in who else but longtime host Eddie Brock, and helped the then federal agent hunt down Carnage, who was trying to resurrecting an Elder God at the time. Sadly, it seems Toxin was killed during the escapade. But you know what they say: if you don't like the death in comics, wait five minutes. At the dawn of the modern video game age, killer games like Doom and Mortal Kombat conjured all sorts of aggressive feelings in helicopter parents. 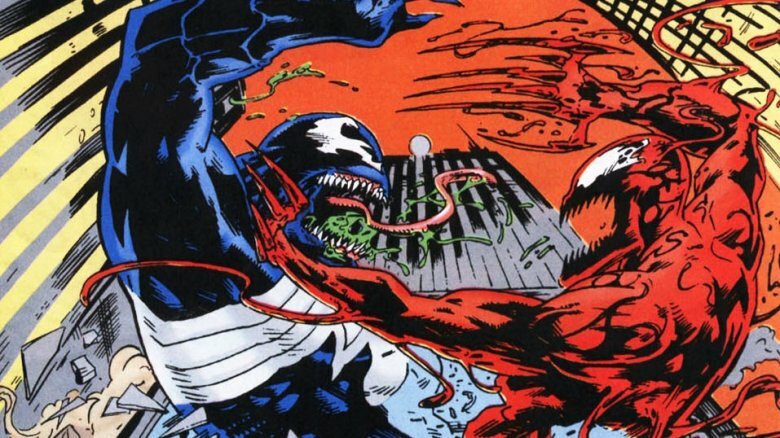 Marvel released their own entrant, Maximum Carnage in 1994, based on the comic story of the same name. In a super-meta move, they followed the game up with another comic, Venom: Carnage Unleashed, loosely based on the video games in general. The four-arc story involved an unscrupulous software company named "Excessive Violence" that develop a scroller based on Carnage's recent rampage through New York. After Carnage uploads himself onto "cyber-space" and starts killing people, Venom follows, trying to defeat him. Naturally, the murderous antihero defeats the ultra-murderous outright villain, but along the way, readers are treated to loads of antiquated parlance like "the net" and "modem," as the slippery duo battle it out. Best of all, the landscapes are rendered in the classic '90s artistic interpretation Internet. Considering dial-up speeds at the time, it's shocking either one of them managed to upload a finger before the final panel ended. Life is looking pretty sweet for Hank Azaria these days. The longtime character actor always had a pretty good setup as one of the main voices of the long-running animated series The Simpsons—where he portrays Moe Szyslack, Comic Shop Guy, Carl Carlson, and Apu Nahsa…hasape…you know, Apu, and other favorites. Azaria also landed a number of roles in the movie and television world, including one of the leads in Roland Emmerich's Godzilla remake, as well as recurring spots on Mad About You and Ray Donovan. His latest critical darling, though, places his face squarely in front of a camera, as washed-up baseball announcer Hank Brockmire in Brockmire. 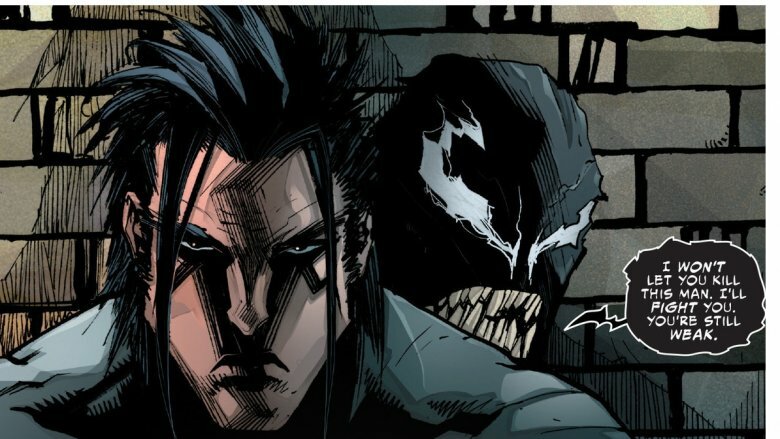 Fans of Azaria and Venom might not realize his connection to the comic book antihero, though. On the classic '90s after-school cartoon, Spider-Man: The Animated Series, he provided the voice for Eddie Brock and his slippery alter-ego. Although he only appeared in eight episodes—including a retelling of the costume's now-classic Secret Wars origin story—Azaria voiced the menacing parasite perfectly. In addition to the Simpsons alum, the web-slinging 'toon had a list of legendary actors attached to it, including Golden Girl Rue McClanahan, Mark Hamill (as Hobgoblin, of course), Nell Carter, Ed Asner (as yet another cranky old guy, J. Jonah Jameson), and Nichelle Nichols. Even Stan Lee made a cameo as himself. Excelsior! For Venom fans, especially those who've been following the tongue-y threat since its inception in Amazing Spider-Man #300, there's only one true host: Eddie Brock. Eddie was first gifted (or cursed) with the Klyntar suit after the two down-and-out puzzle pieces met in Our Lady of Saints Church, both seeking redemption—which didn't seem to work out well them. Since then, they've bombed around the Marvel Universe, putting Peter Parker through untold hell, as well as helping him out on occasion. However, when Eddie's cancer returned, even though his toothy amigo kept him alive, he chose to make a few changes to his vigilante lifestyle. He decided the best way to be rid of the spiteful skein was auctioning it off for charity in Marvel Knights Spider-Man #7—nothing could go wrong with that plan, right? The winning bid went to local Mafioso Don Vincente Fortunato, who gave the alien parasite to his son Angelo, so he could make, or more so, metamorphose, something of himself. The charming lad proceeded to assault and slaughter several of Peter Parker's classmates before realizing its new host was a creep. It rejected the Don's dastardly son in mid-building-leap, and he fell to his death. Not long afterward, Venom found his best relationship yet, with super-suit fiend and Scorpion-enthusiast MacDonald "Mac" Gargan. Most of us would assume that, as a symbiotic entity from outer space, Venom is beholden to his hosts for a temperament—at least one beyond his Spider-Man hate-on—and voice. True, in the early days, the symbiote takes the back seat, content to sip succulent brain chemicals while imbuing its hosts with incredible strength and superpowers. 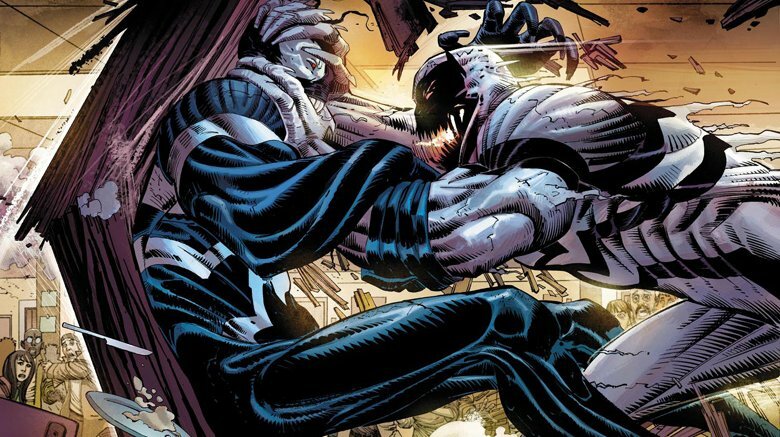 However, Venom does have its own voice, and while often shunted into the royal we, it has on more than a few occasions voiced an opinion contrary to that of his hosts—although usually just as a way to get its hands on some fresh gray matter. After being "cleansed" of its rage addiction by the Klyntar people in Guardians of the Galaxy #23, the symbiote took to its partnership with Peter Parker's former high school foe Flash Thompson with renewed vigor and valor. 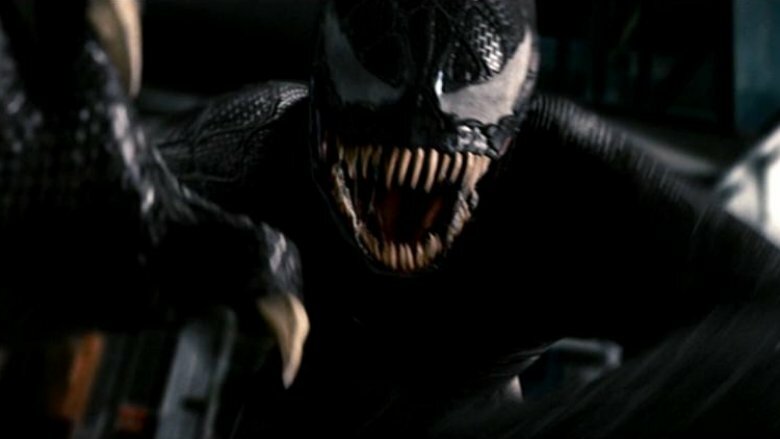 After it was separated from Flash in 2016's Venom reboot, it sought a new host in former Army Ranger Lee Price. Despite being weakened and unable to escape, thanks to Price's psychological training in the military, it continuously criticized Price's illicit behavior and callous violence—even trying to sabotage his criminal activities. 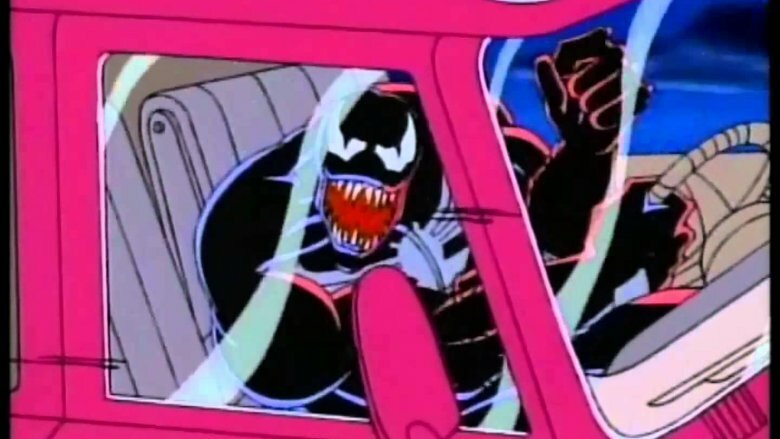 Of course, once Spider-Man teased it with a reunion, Venom seemed to revert to its rage-filled state. Way to crush all that character development, Spidey. Very uncool. 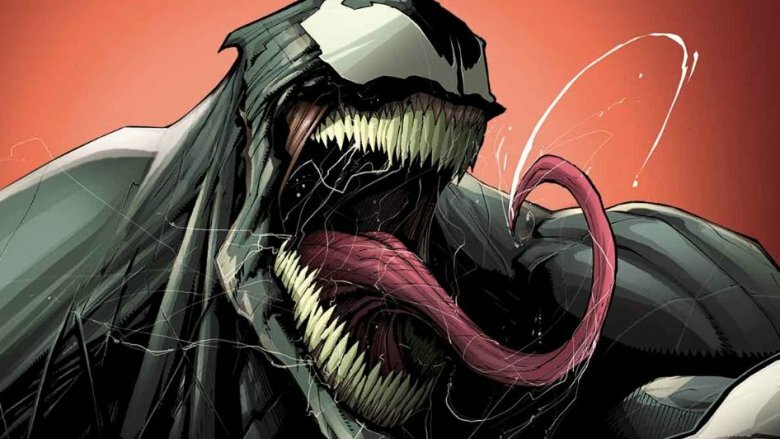 Venom's origin varies, depending on which Marvel story you read. Beginning life as a costume change for Spider-Man, it grew into a creepy living skin, before finally being revealed as a sentient, symbiotic entity. In addition to self-awareness, Venom landed two official histories. The symbiote's first backstory was established during the aptly named "Planet of the Symbiotes" story arc in 1995. Taking place throughout several oversized one-shots, including Venom Super Special #1, the narrative introduces a whole mess of slavering alien life forms. It seems members of Venom's species decided the Earth was looking far too delicious, what with its hundred course meal of unseasoned emotions and neuroses. During a trip to a conquered planet, the truth about symbiotes comes out. Unsurprisingly, the otherwise-unnamed race isn't exactly the sympathetic type (rather, more the hostile, domineering folks). As a result, sweet little Venom became an outcast due to his benevolent nature, as its whole cooperate and share feelings outlook didn't sit well with their conquer and command attitude. Eventually, Spider-Man, Venom, and Scarlet Spider managed to beat back the savage skins. Perhaps due to their defeat (but probably thanks to the magic of retroactive continuity), the nasty symbiotes' backstory changed into a peaceful one twenty years later. In the meantime, it made for a curious adventure into the darkest heart of codependency. As Spider-Man quickly found out, it's never a good idea to reject a symbiote—especially one who hooks up with Spider-Man hater, Eddie Brock. 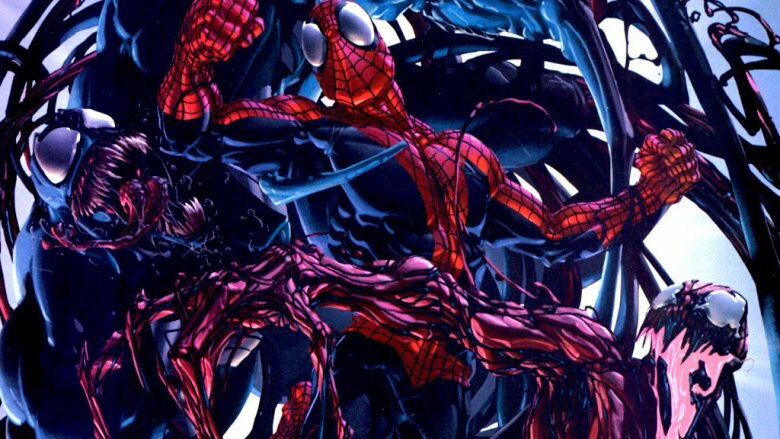 Just imagine what would happen if the symbiote had attached itself to someone with a real ax to grind, such as one of Peter's longtime enemies or exes. In Comic Creators on Spider-Man, Spidey writer David Michelinie discussed the origins of the Klyntar alien. When planning for Amazing Spider-Man #300, Editor Jim Salicrup sought a killer hook for the anniversary issue. Michelinie took the opportunity to break down his idea: a man is run over and killed by a cabbie, who's distracted by a Spider-Man-related battle, right in front of his wife. Due to the trauma, she goes into labor and her child tragically dies during birth. Consumed by misdirected hatred, the Spider-hating woman is sought out by the symbiote, who also has a beef with the Web-head. The two bond over their loathing and hunt down Spider-Man. Ironically, Salicrup shot down the idea, worrying readers wouldn't believe a Venom-empowered woman could take down Spider-Man. We guess he forgot the old saw that hell hath no fury like a symbiote scorned. Long before the Secret Wars of 2015, which rebooted the Marvel Universe, Marvel's first Secret Wars—Battleworld, in particular—introduced Spider-Man to a sleek, freakily responsive black suit that eventually transformed into one of his greatest enemies. Because comic book companies love to futz with continuity, or at least, the writers of Deadpool do, the Merc with a Mouth also played a retroactive role in symbiote abuse during Deadpool's Secret Secret Wars. The continuity side-step, brought to us by writer Cullen Bunn, turns the worm so Wade Wilson first discovered the fancy costume. Not only does the twisted revamp revel in lampooning the epic crossover, one of Marvel's first major events, but it also gives Deadpool a chance to rewrite history in his inimitable fashion. After the Hulk discovers a "super-science seamstress," Deadpool decides to get a few alterations. Now covered in the self-adhesive suit, Wade quickly recognizes that the suit isn't just a suit. It's sentient. Spending any amount of time inside his mind, though, Wade worries "isn't fair" to the creature. So he rejects the symbiote, worrying that he's "driven it nuts or something," while setting up decades of carnage (pun intended) to follow. When it came to Venom, Spider-fans probably pondered the symbiote's true beginnings at first. In the long run, though, all it took was an attachment to complicated old Eddie Brock to drive the story forward. 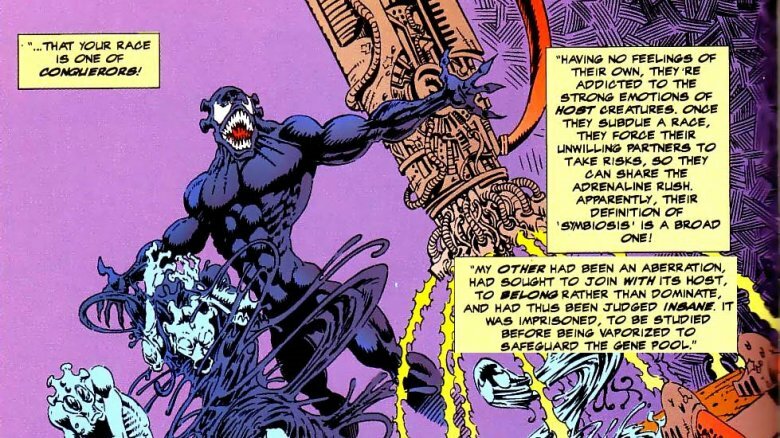 Nevertheless, Venom received a semi-backstory in the "Planet of the Symbiotes" arc in 1995, during the height of alien death-skin fever. Even though the tale revealed an entire planet of the parasitic life forms, the alien race didn't receive a designation—along with a revamped origin story—for another 20 years. 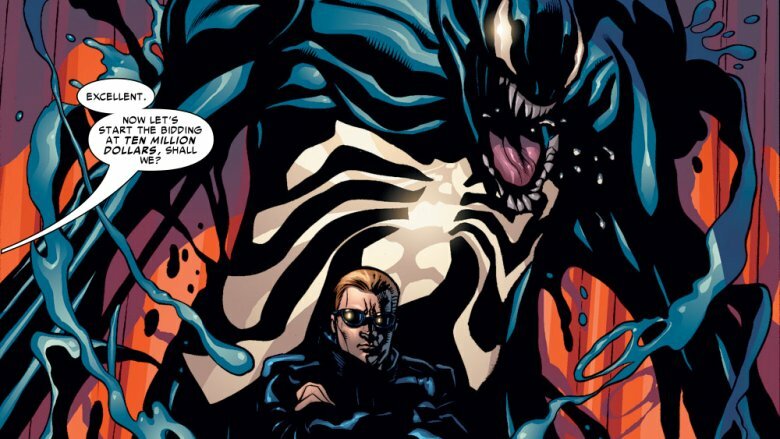 During his time kicking it with Flash Thompson and the Guardians of the Galaxy, Venom finally received an official origin story. Guardians #23 introduced the Klyntar species, while also clarifying them as a benevolent group, misconstrued by the kookier elements of their race. 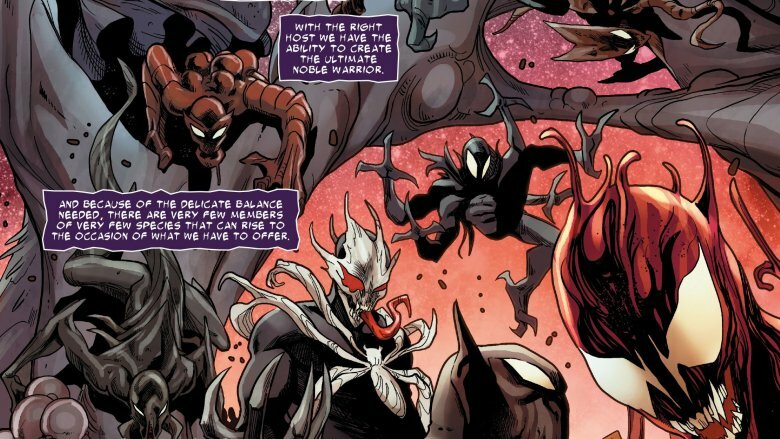 Apparently, the symbiotes need to bond with the evenly balanced individuals. When their hosts don't have their you-know-what together, a symbiote easily becomes corrupted—much as what happens with Venom and Eddie Brock's intense Spider-loathing. 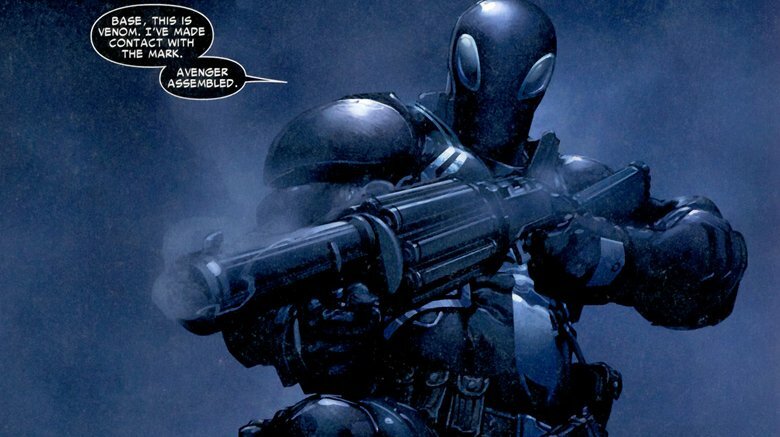 It also didn't hurt that Venom spent some time with Deadpool, thanks to a retcon. When you're a symbiotic life form, capable of adapting to almost any environment and giving your host superior strength and killer powers like web-shooters and wall-crawling, life is pretty sweet. For the most part, Venom really didn't have much to fear, aside from its established dislikes, such as fire and sonic blasts (turn-ons include brain chemicals, codependency, and Spider-Man hating). However, aside from Peter Parker on a bad day, the Klyntar do have one known predator. In the 1996 miniseries, Venom: The Hunted, our friendly neighborhood conjoined antihero was stalked by a Xenophage. 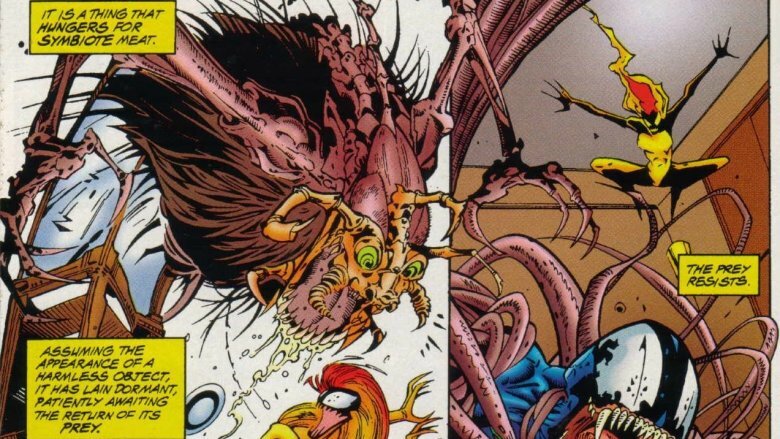 Apparently, these nasty alien critters have a taste for symbiote-host brainwaves that just can't be sated—well, aside from an all-you-can-eat buffet at the Symbiote Sizzler, anyway. Xenophages can also transmute themselves into other shapes, at one point it even hid out as a china cabinet. It took the force of every symbiote on the planet to take out one of these nasty armoires—er, aliens. Ethan Allen, eat your heart out. Scratch that: Ethan Allen eats your brain out. Before Deadpool was retconned as Venom's first host, Spider-Man was the first human to don the alien skin. Upon his return from space, after Secret Wars' intergalactic superhero showdown, he discovers his new duds have feelings and gets Reed Richards to blast it off with a sonic weapon—always handy to have around. When the suit returns in Web of Spider-Man #1, sneaking into Peter's closet and disguising itself as his classic Spidey-suit, it tries to perma-bond to Peter. Peter knows the symbiote is vulnerable to sound and fire, but lacking a lighter and hairspray or an air horn, he has to improvise— or find himself a perpetual resident of codependence city. Since Peter's a long way from the Baxter Building, the home of the Fantastic Four, he's quickly running out of time, at least until the bells at Our Lady of Saints begin to chime. Their cacophonous ringing, coupled with Peter's rejection, forces the alien suit to flee the scene. Suffering from the bad break-up, it stumbles into the church, finding an angry young Spider-foe in the making named Eddie Brock. The rest, as they say, is history. Despite brain-eating being established early on in the mythos, Venom rarely if ever indulged in this practice—at least until the Mac Gargan days, when they munched on a human or two, as well as a gaggle of Asgardians. During the 1996 series, Venom: The Hunger, the symbiote's blood, er, brain-lust gets the better of it, though. Fortunately, for those of us who enjoy their cerebellum in one piece, Brock discovered an antidote, chocolate. Early on, Brock is separated from the symbiote after refusing to indulge in its brain-eating—way to choose your enabling moments, Eddie. Forcibly detained by a not particularly therapeutic therapist, Venom goes on a brain-hunt, which is similar to a vision quest but with a lot more mind munching. Eventually, it's revealed that the alien skin doesn't crave juicy gray matter as much as a chemical it produces known as phenethylamine. After the ordeal, Eddie digs up another source for so-called "love drug": sweet, sweet chocolate. Now that's a cranium chomping cure-all we can all get behind. Some Spider-fans consider Sam Raimi's Spider-Man trilogy the definitive wall-crawler saga. However, Spider-Man 3 came as a major disappointment to many devotees, despite its box office haul. Not only did it slow momentum in the otherwise wildly popular series—there was a planned fourth flick in the works—but it introduced antihero Venom in a rushed and unsatisfactory manner. In addition, Topher Grace, previously known as Eric Forman on That '70s Show, was miscast as the usually meat-headed Eddie Brock. Heck, the entire feature had a slapdash feel to it, something off-kilter coming from the meticulous and stylized Raimi. There's a very good reason for the shortcomings of the movie: years later, Raimi discussed the changes and what could have been. The Vulture and Sandman were intended to be the main villains initially, but producer Avi Arad (understandably) felt an old guy in a bird getup wouldn't crank out toy sales. As a result, he pushed the director to include Venom and the full-circle story where Harry Osborn becomes the new Goblin. By the time the studios interjected Captain and Gwen Stacy into the mix, the story was overloaded with characters and the picture simply became unwieldy. Hopefully, Venom gets a more admirable reintroduction in his solo flick. Plus, it would be awesome if Raimi gets another shot at a Spider-flick, studio meddling-free. While Tom Hardy will be taking on the role of Venom in the character's first major solo film in 2018, it's hardly the first time someone has tried to bring Venom to the big screen for his own movie. There were plans for a spinoff series after Eddie Brock made his appearance as one of the villains in Spider-Man 3, but there was an attempt even before that. As early as 1997, New Line Cinema was making a serious effort to make Venom: The Motion Picture happen. While the idea of Venom getting a movie before Spider-Man might seem completely bananas for long-time fans, it's worth noting that there were just as many attempts to get that movie going before the turn of the century as well, including a time when James Cameron was attached to direct. While Spidey wouldn't make it to cinemas until 2002 with Sam Raimi at the helm, the Venom movie came closer than most, to the point where it even had a screenplay by David S. Goyer and was rumored to have Dolph Lundgren in talks to star. Not a bad choice when you consider how often artists of the '90s drew Eddie Brock to look like an even more jacked version of Ivan Drago. 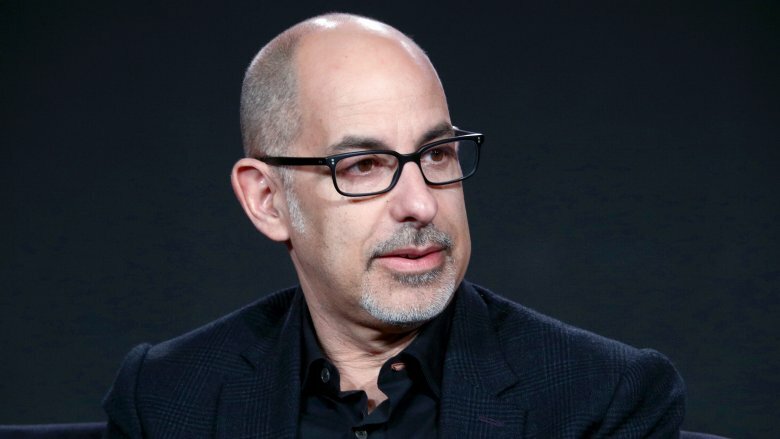 Goyer, of course, would break through into superhero films as the writer of 1998's Blade, and after writing both of its sequels and directing Blade Trinity, would also provide the script for Batman Begins, Man of Steel and Batman v Superman: Dawn of Justice, along with a handful of other superhero projects. If big-budget superhero movies aren't your thing, you don't need to wait to see an interesting live-action take on Venom thanks to Joe Lynch's Truth in Journalism. Released as a fan film in 2013, the documentary-style movie follows disgraced photojournalist "Eddie B." as he makes his way through the streets of New York, finding — and occasionally manufacturing — salacious news stories. Needless to say, it turns out that Eddie's hiding an even bigger secret. Spoiler warning: he's actually a weird symbiote monster from space who eats people. Even though it's a foregone conclusion from the first shot, the big reveal of Venom at the end is incredibly well-done and remarkably tense, kicking off with a thrilling gross-out sequence where he pukes up the symbiote before turning against the film crew that's been accompanying him on his adventures. Ryan Kwanten, of True Blood fame, also does a great job with this movie's version of Brock as a completely amoral opportunist, building his quiet sense of menace throughout. If you've never seen it, it's well worth the 20 minutes it'll take to give it a watch, but make sure you stick around after credits. Like most Marvel movies, there's an additional surprise to be found. 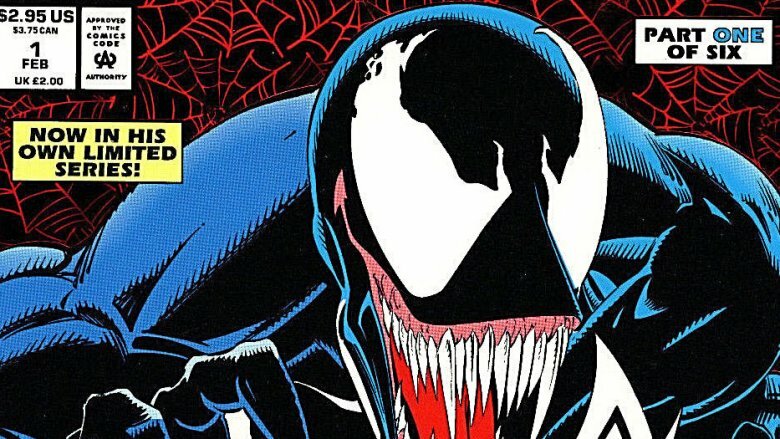 In the 1990s, Venom was easily one of Marvel's single most popular characters, for a pretty obvious reason. He was basically Frank Castle plus Peter Parker, a grimmer, grittier Spider-Man who billed himself as a "lethal protector" and had a mouth full of teeth so long and sharp that even Wolverine thought it was a bit much. He was so popular, in fact, that from 1993 to 1998, there was a new issue of Venom on the stands every single month without missing a beat. It just never managed to get past #7. Rather than being a single series that ran from #1 to #60, Venom's ongoing adventures were broken out into a staggering 17 different series that ran back to back to back to back to back to back to — well, you get the idea. It started in February of '93 with Venom: Lethal Protector #1 – 6, and ran through stories like Separation Anxiety (four issues in '94 to '95), Sinner Takes All (five issues in '95), License to Kill (three issues in '97), and a dozen other miniseries, plus a handful of specials thrown in for good measure, before finally wrapping up with the appropriately named three-issue Venom: The Finale in January of 1998. As for why they didn't just keep Lethal Protector going after its first six issues, or at the very least launch a real ongoing once they were a couple years into this whole needlessly complicated experiment, well, that's simple. Everyone knows that a #1 issue is more valuable for collectors, right? And what's better than one #1? Seventeen #1s! Wait, what do you mean that's not how supply and demand works? Ever since Peter Parker discovered that the black costume he picked up during Secret Wars was both fashionable and a sentient creature hell-bent on controlling his body, Venom has been considered one of Spider-Man's deadliest foes. It only got worse when the symbiote joined up with Eddie Brock, whose hatred of Peter only amplified the alien costume's resentment after being rejected. It doesn't take a lot of analysis, however, to see the subtext in that relationship. The rejection, the jealousy, the new partner picked up on the rebound — for all intents and purposes, the symbiote is basically reacting like a scorned lover. But here's the thing: that's not just subtext. 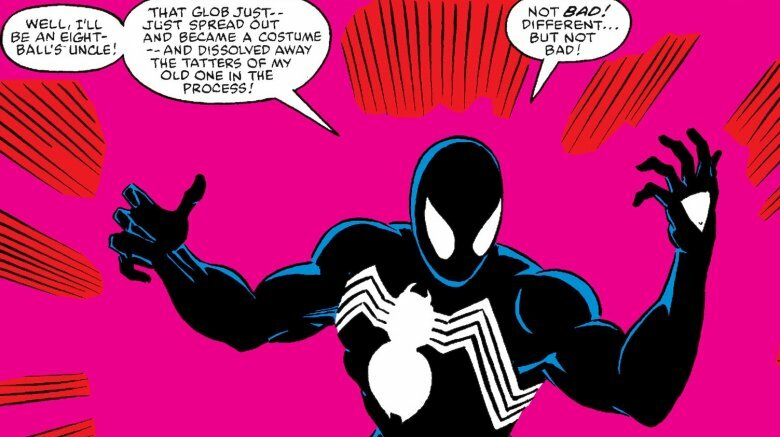 The idea that the costume was actually in love with Peter was the focal point of one of the greatest Venom stories of all time, which ran courtesy of writer David Michelinie and artist Todd McFarlane in Amazing Spider-Man #317. The idea was that after subtly threatening Peter's family, Eddie Brock challenged Peter to a one-on-one fight to the death with no interference from the Fantastic Four, far away from any church bells that could put the symbiote out of commission. Alone and completely outmatched in terms of strength, Peter made the desperation move of stripping off his costume and allowing the Venom suit to return to its first love. If the subtext had been difficult to see before (it wasn't), then the sight of Peter Parker standing on a beach in tiny underpants offering up his body while shouting "you want me? Then take me! I'm yours!" and thinking about how the symbiote was still in love with him put an exclamation point on the whole thing. It worked, though — the symbiote's relationship with Eddie turned out to be too deep to drop all at once, leaving him passed out on the beach in his underpants covered in a viscous ooze. That ain't subtext anymore, folks, that's super-text. While he's come pretty close on several occasions, Venom has never been able to truly defeat Spider-Man once and for all. He did, however, beat the living tar out of Superman in a fistfight back in 1996, so he's got that going for him. It happened in DC/Marvel: All Access #1, the first installment of the series that followed up on the world-colliding DC vs. Marvel crossover from earlier that year. Since the original story had matched up characters and determined the outcome by having fan votes, Venom brutally trouncing the Man of Steel might not be the strangest result of the entire project, but it's pretty darn close. To his credit, Superman manages to hold his own for the most part, but you'd think that a guy who can shoot heat lasers out of his eyes and make a sonic boom by clapping his hands would probably have a pretty easy time fighting someone whose major weaknesses are loud noises and fire. 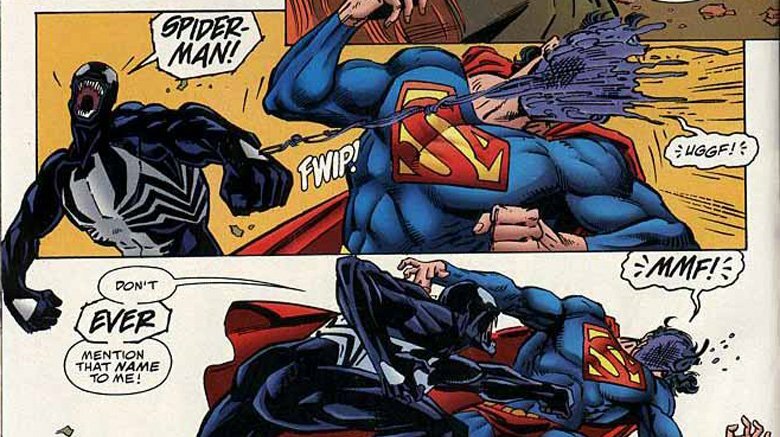 And yet, once Venom flies into a rage, he not only goes toe-to-toe with the Last Son of Krypton, he also beats up Superman and Spider-Man at the same time. The only reason the good guys are able to pull off the win is the intervention of a third character, Access, an obscure goofball who's jointly owned by Marvel and DC and apparently has the deus ex machina powers of both companies rolled into one. It might technically be a loss, but when Superman needs the help of two other heroes just to take you out of the fight, that's as good as a victory any day. If you're familiar with Spider-Man foe Mac Gargan, it's probably from his original villainous identity: the Scorpion. Introduced in 1964, Gargan was a crooked private eye hired by J. Jonah Jameson to dig up dirt on everyone's favorite web-slinger, but when that didn't work out, JJJ decided that it would probably a good idea to do some mad science on him and give him a robotic scorpion tail instead. This was not, in fact, a good idea, and wound up creating a supervillain who hated Spider-Man and Jonah in equal measure, and remained one of Spider-Man's most reliable foes for years. In 2005, however, he decided to go in a bit of a different direction. When Eddie Brock found Jesus, he decided to give up the symbiote and accept his fate of dying from the cancer that the suit had been keeping in check for years. Gargan won an underworld auction and became the new Venom, and not only did he fight Spider-Man in this identity, he actually replaced him, too. When Norman Osborn was put in charge of Homeland Security, he put together a new team of Dark Avengers, made up of supervillains standing in for heroes. Moonstone was made the new Ms. Marvel, Bullseye was the new Hawkeye, and Gargan, with the Venom symbiote, was his team's all new, all-murderous Spider-Man. As for Eddie, well, it turns out that he didn't die of cancer at all. 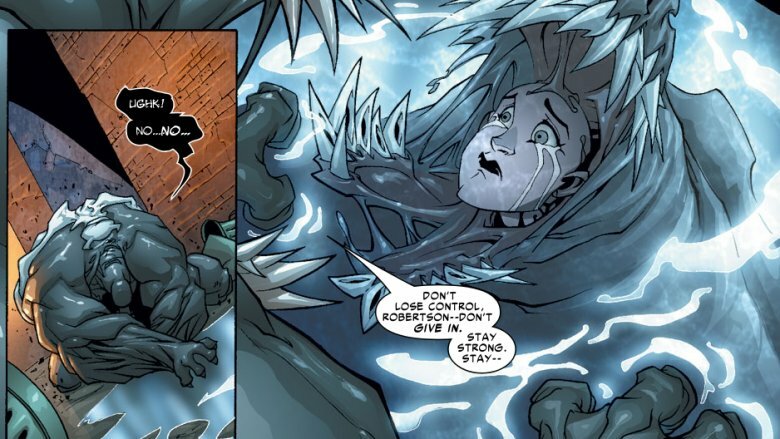 Instead, the combination of another villain's healing powers and a chance encounter with an old symbiote caused a reaction that gave Brock his powers back — and more. 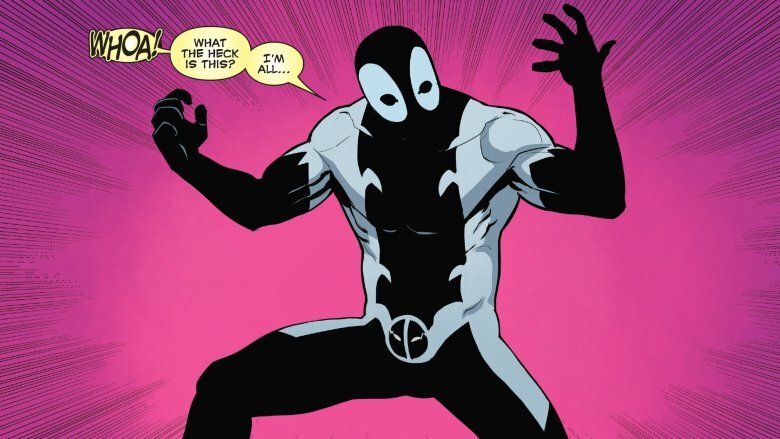 Rather than just the black costume, this new version turned him into a sort of color-inverted version of Venom who had the ability to cure others of symbiote-related afflictions and fought crime as — wait for it — Anti-Venom. During Peter Parker's high school days, no supervillain tormented him quite as badly as Eugene "Flash" Thompson, a classmate who constantly picked on "Puny Parker" and was, ironically enough, the literal president of Spider-Man's fan club. Eventually, a school-sanctioned boxing match against his scrawny foe — who just happened to have the proportionate strength and speed of a spider — put a stop to that, and the two became friends. By the '70s, Flash was even the subject of some of Amazing Spider-Man's more socially relevant stories when he was drafted to serve in the Vietnam War. By 2008, the timeline of the Marvel Universe meant that Flash was instead a veteran of the Iraq War, where he lost both of his legs to a roadside IED. In 2011, his heroic ideals and history of valor in service made him the military's ideal candidate for a program designed to create a new kind of super-soldier: Agent Venom. Bonded with the Venom symbiote for 48 hours at a time, which also formed a new pair of legs, Flash served as a member of both the Secret Avengers and the Guardians of the Galaxy. Eventually, though, he lost the symbiote back to Eddie Brock, and instead became Agent Anti-Venom, because nothing in superhero comics is ever that simple. Readers with fond memories of the '90s might recall the New Fantastic Four, an awesome, tongue-in-cheek comic where the FF went missing and were replaced by a quartet of Marvel's most marketable heroes. Billed as "The World's Most Collectible Comics Magazine," the new roster was made up of Spider-Man, the Hulk, Ghost Rider, and, of course, Wolverine. In 2012, though, there was another unlikely group that was formed to deal with the demonic threat of Mephisto, re-creating the New FF with a hilariously dark twist. It was called the Circle of Four, and each member was a present-day equivalent to their counterpart. 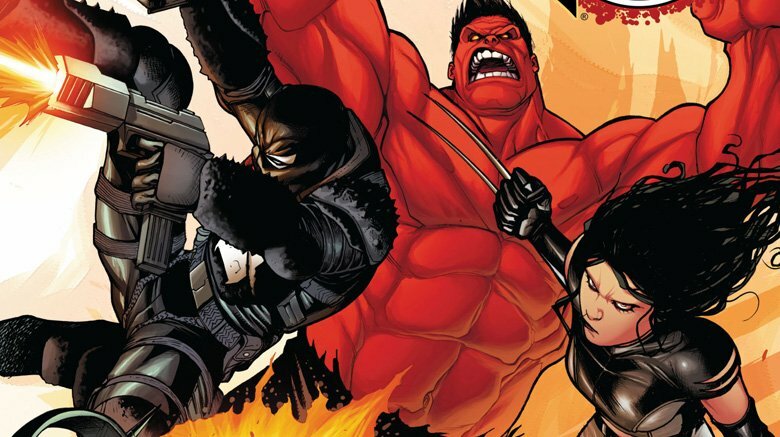 Agent Venom filled the role of Spider-Man, the Red Hulk stepped in for the Hulk, and Wolverine was replaced by X-23, his young female clone who would eventually take over as the All-New, All-Different Wolverine. And Ghost Rider? He wound up being replaced by two different versions of the character: the original motorcycle-riding hellion, Johnny Blaze, and his new protege, Alejandra Jones, neither of which had been the Ghost Rider in the original story. Sadly, like the team that inspired it, this amazingly weird gathering of heroes didn't stick together. But who knows? When the time is right, maybe the Circle of Four (which is actually the Circle of Five) can get back together. Maybe they can even team up with the New FF as the new Fantastic Eight or Possibly Nine! 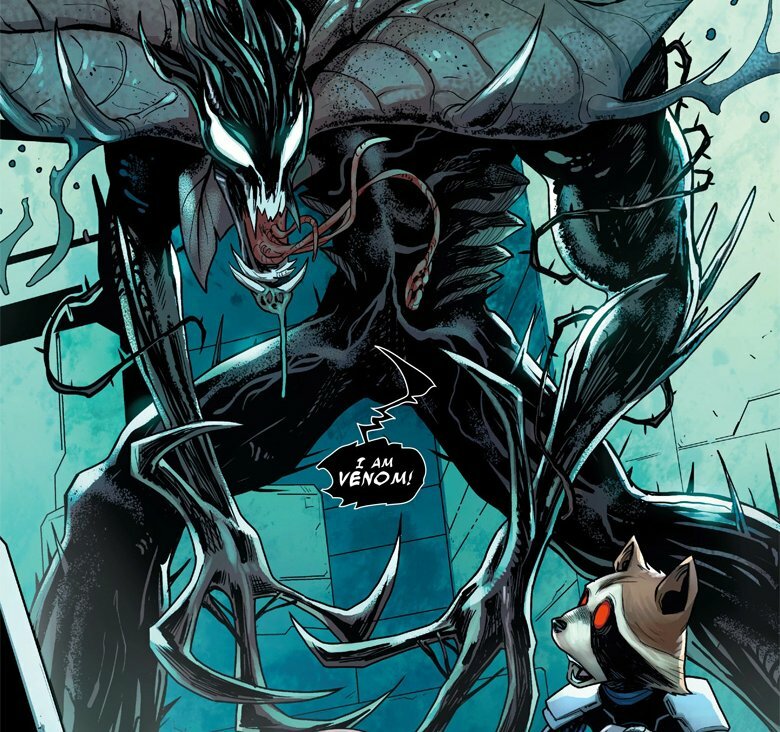 While it's nice to be able to talk about the Klyntar without having to use the word "symbiote" over and over, the reveal of Venom's species name wasn't the only big moment that came out of the Guardians of the Galaxy's team-up with Agent Venom. 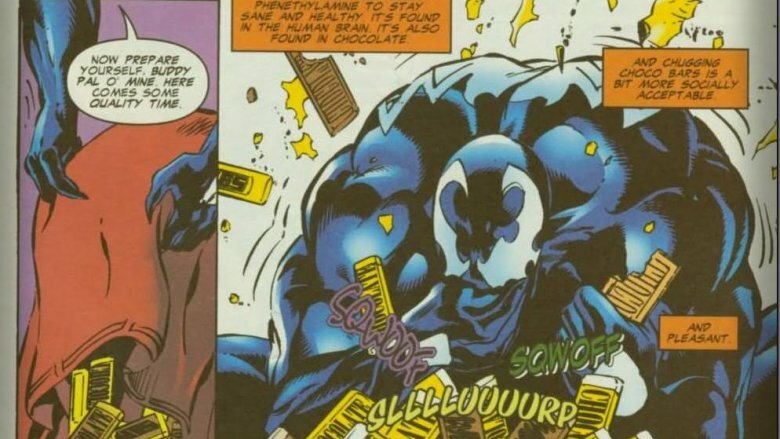 We also got what might be the single weirdest example of Venom possessing another character, ever. And that's saying something. From Eddie Brock to Mac Gargan and all the way to that one guy who became Venom because he really wanted girls to write fan fiction about him (no, really), there have been plenty of strange moments of the symbiote bonding with a new host. There are even weirder ones if you count What If stories like the one where it took over the Punisher, or Peter Parker's corpse. This one, though? This one was right there in the core Marvel Universe, and it's amazing. In Guardians of the Galaxy vol. 3 #21, the Guardians accidentally leave the symbiote unattended long enough for it to break out and take over Groot, meaning that there was a time when Venom was an alien costume with spider powers bonded to a talking tree from space. If that wasn't enough, the next issue saw it taking over Rocket, too, throwing a little space-raccoon into the mix for good measure. Peter Parker might be its first love, but it turns out that thing isn't exactly picky when it comes to partners. If you go into it looking to find out what happened to your favorite superheroes, Mark Millar and Steve McNiven's Old Man Logan is a pretty huge bummer. Structured as a western about a broken, older Wolverine and a blinded Hawkeye driving across a devastated America that's been carved up by supervillains, it's structured entirely around revealing how the heroes of the Marvel Universe died…or worse. If you like Venom, though, buckle up, because you're going to have a good time. One of the minor plot points — and the fact that this is minor should be a good indication of how messed up things are in that future — is that the dinosaurs of the Savage Land have taken over a big chunk of the midwest. To make matters worse, Logan and Hawkeye encounter one of those dinosaurs on their journey: a Tyrannosaurus Rex that's bonded with the Venom symbiote to create Earth's perfect killing machine. The kicker of it is that while a Venom T-Rex (V-Rex?) has no real reason to attack Hawkeye and Wolverine on their own, they made the mistake of driving through its territory in Spider-Man's old car, the Spider-Buggy. It turns out that even in a dinosaur, those memories of how much it hates Spider-Man tend to stick around, and even the sight of a car is enough to enrage it.